"'Til Ya Make It" on The Secret Life of the American Teenager summer season finale! "'Til Ya Make It" aired on ABC Family's The Secret Life of the American Teenager summer season finale, September 5, 2011! Download "'Til Ya Make It"
The Official Jamie Lynn Noon App features music, photos, video and more! Stay connected with Jamie on Twitter and Facebook from your iPhone and/or iPad. This is a complete revamping of The Jamie Lynn Noon app. We've added several great new features as well as adding an iPad version to this update. "I am offering my music to raise money for the Leukemia & Lymphoma Society, a cause very close to my heart as I lost my grandmother to Lymphoma in late 2006. In exchange for your $3 donation to this organization, I am offering a High-Quality MP3 digital download of a song titled "'Til Ya Make It" off my recent release ('Angels Spoke'), and an exclusive Klubjumpers Remix (Radio + Extended Version) of "A Moment to Break", the title track off my debut EP. You will also receive a PDF download of the album artwork and an 8x10 autographed photo." Jamie is featured in the February 26, 2011 Issue of Billboard Magazine, at newsstands now! 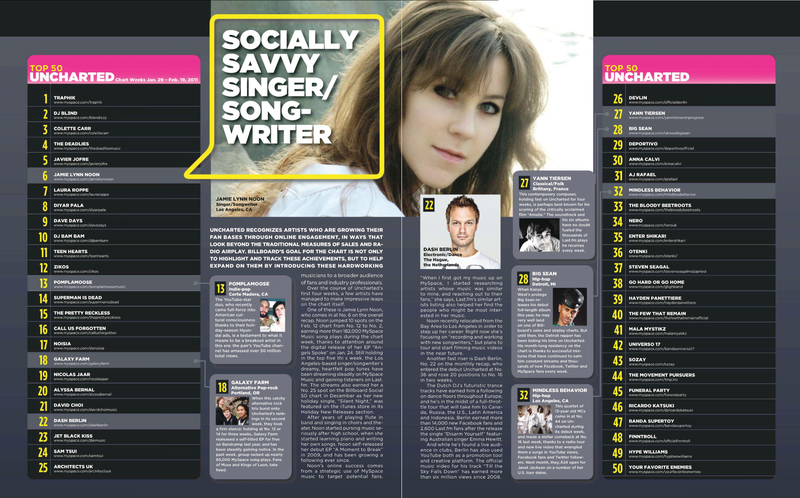 Pick up a copy to read the full feature article, "Socially Savvy Singer/Songwriter".